French-born Sydney artist Bruno Jean Grasswill has won the Art Gallery of New South Wales’ 2015 Packing Room Prize with a portrait of leading Australian actor Michael Caton. The Packing Room Prize – a cash prize of $1500 – is awarded to the best entry in the Archibald Prize as judged by the gallery staff who receive, unpack and hang the entries. Should there be any dissent among the packers, the head of the packing room, Steve Peters, with 51% of the vote, gets the final say. The 2015 Archibald is Peters’ 33rd and the 24th Packing Room Prize he has awarded. Steve Peters said that when Bruno Jean Grasswill’s work arrived at the gallery, he thought it was, “Loud, looked very bright and – more importantly – looked just like Michael Caton. “I think the portrait is terrific. For me, it was always going to be a contender. That’s what the other guys thought as well,” Peters said. As soon as the portrait was unveiled in the packing room, gallery staff responded to the canvas, joking about jousting sticks – a reference to the movie The Castle, a favourite of Peters’. In the 1997 film, Darryl Kerrigan (played by Michael Caton) hears someone is selling second-hand jousting sticks for $450 and reacts with the line that now lives in the Australian vernacular: “Tell him he’s dreaming”. For Bruno Jean Grasswill, 69, entering the Archibald Prize has become a tradition. Winning the Packing Room Prize comes after submitting work for the Archibald so many years since moving to Australia in 1971 that he can’t remember how often he’s entered. 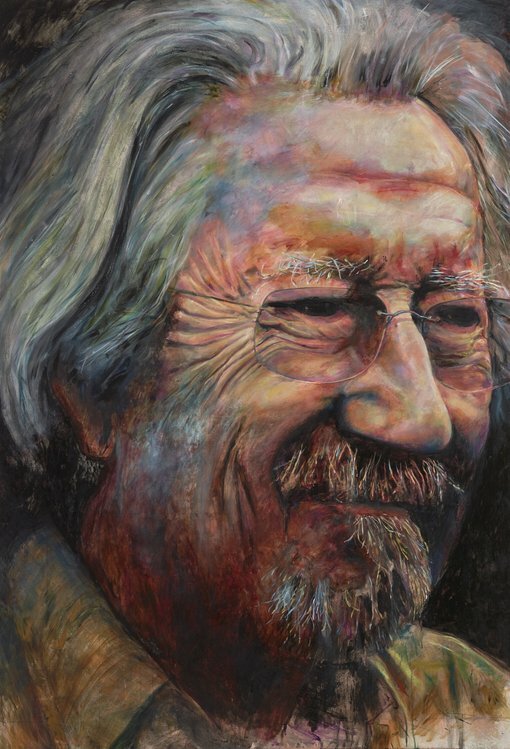 His portrait of Michael Caton is the first time he has been a finalist in the Archibald Prize, although he has had two paintings hung in the Salon des Refusés. Bruno Jean Grasswill chose Michael Caton as his subject after meeting him socially. Caton agreed to sit for an Archibald portrait and the two enjoyed a four-hour lunch in the artist’s backyard, next to his studio, enjoying lively discussions about life. “I saw a contradictory rawness and sophistication in Michael’s face. In presenting a discreet smile while he peers into the dark side of life, I’m mixing Shakespearean comedy and tragedy,” Bruno Jean Grasswill said. Peters said Bruno Jean Grasswill’s painting was “great” and in keeping with the prize’s history. The Packing Room Prize’s unusual traditions date back to a 1991 off-the-cuff comment Peters made about a portrait of Gareth Evans “winning the Packing Room Prize”. “Congratulations also to Bruno. He has expertly captured my thoughts and feelings after what was a long and enjoyable lunch together. Did he say the lunch was four hours? It did seem to me that it was much longer! “As much as I can remember, Bruno headed straight to the studio afterwards to keep working on the portrait,” Caton said. Bruno Jean Grasswill receives $1500 as the winner of the Packing Room Prize. The Archibald, Wynne and Sulman Prizes, the Young Archie competition and the Archibald Prize regional tour are all generously sponsored by ANZ. This year there were 832 Archibald, 653 Wynne and 518 Sulman entries. The exhibition opens to the public on Saturday July 18.